THE MOST RECENT figures from the Central Statistics Office show that there are over 92,000 people in Ireland who are Deaf or have hearing disabilities. 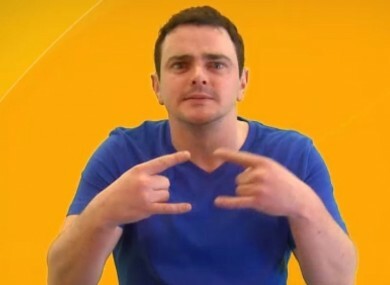 The Irish Deaf Society estimates that around 5,000 people use Irish Sign Language (ISL) as their first or preferred language and campaigns to have it recognised as an official language in Ireland. As it stands, the language, and many unique issues faced by the deaf community can often go unrecognised by society and particularly by the media. Communication difficulties are often used as an excuse as journalists would have to conduct interviews with a Deaf person through an interpreter, whether on the phone or in person. Literacy levels among the Deaf community are also considerable lower than in the hearing community which can deter Deaf people from interacting with the media. This TheJournal.ie author recently spent a day with a Deaf family for an RTE show, Hands On, in which they explained that the Deaf community feels it is being neglected by the Irish media. Brian Crean and his wife Teresa Lynch are both deaf and have two hearing children who use ISL. Brian said he and Teresa are often made to feel like second class citizens as they struggle to get their points across to doctors, teachers and other people in outside of the Deaf community and he does not feel that the problems they face are ever represented by journalists in any media format. In the course of filming Hands On, this TheJournal.ie staffer (with no sign language) was challenged to understand and communicate with the family to learn more about their everyday lives and concerns; and about the stories we should be covering. The show airs today at 12.40 on RTE One but until then, here’s a sneak preview. Tune in and let us know what you thought. Email “Ireland's Deaf community feels neglected by media”. Feedback on “Ireland's Deaf community feels neglected by media”.